Hey yep running English Client, playing on EU server. I ended up disabling all addons, renamed WTF folder, deleted Cache, log, error folders, and only had your addon installed, and it still did not work. Here are some data i collected. Thanks for the report will look into it. 1. "Max/Total Missing" is inverted. Max should be on the right, missing on the left. As a possible alternative... maybe just "Total Remaining" to show you how many items for your current character are left. Then you don't have to worry about the X/Y. Just hey, you need X more. 2. Not sure it is a bug, mentioned below, but bosses stick around when you've learned their inventory of drops. Having them just fall off (display if remaining > 0, else hide type thing). 3. Agree with having 'completely learned' dungeons either disappear, or maybe better, sink to the bottom of the list. So it might be 2 lists, instances with items remaining, instances fully learned. But most importantly - this is a fantastic addon already. Thank you for your time and effort! 1. currently the numbers don't make a lot of sense, and until I fix duplicates, there isn't any reasonable value to use. 2. yes, it's a bug that will be fixed. Are you planning to expand it to non-drop/instanced content ? The vendor items (pve and pvp) especially as well as some outdoor content or BoP profession items would be certainly useful. Then there is the BoP world drop, which I'm not sure how to reference, but I'm confident the community needs this kind of help to complete their collection. The source of the items is directly from the game. But yeah possibility to do in the future, just not now. Hi, awesome addon you have here. Is there any way you could add the customisation to choose that the max/total bit shows completion instead? So that it shows the amount you have from the instance/area and then the total? Seeing stuff like 20/20 for broken isles gets confusing as I keep thinking I'm done with Broken Isles rather than haven't got any. I know the numbers currently don't make much sense, but I wanted to add so you at least have some idea of how much you can actually get from given instance. The addon currently doesn't keep track of your 'completed' mogs, so it can't calculate progress. It's definitely doable for the future though, will just need a bit bigger changes. Possibly you could just go the total minus the amount you are missing? That would be a quick way of doing it rather than having to count the amount collected? If you mean Total as the number displayed by the addon currently, it's also just mogs you're missing. Total = amount of missing mogs in all difficulties together. If you mean Total as in real total, then my answer above applies. Ah ok, it seems I was misinterpreting what max and total meant. 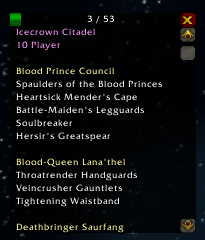 Hey, though this addon is a really welcome help to my obsessive need to collect everything in the game, I'd like to list a few requests/ideas that might make the addon a bit less cumbersome. Please not that I really appreciate the work you've put into this and I don't want you to think this is some form of criticism/nagging, just some QoL improvements. 1. Adjustable window size - Some of us are plebs that play on 17'' laptops and the addon takes almost 1/3 of my screen when I have both the list and the instances up. 2. Have the specific instance widow not close when you close the list. 3. The possibility to refresh a single instance instead of the whole list. 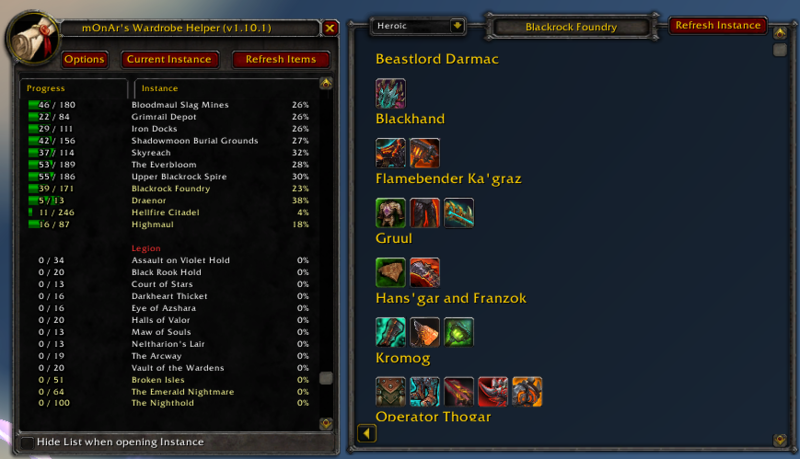 I don't know anything about how addons are made, but if I want to look at the 2 instances I want to farm for the day, it's a bit annoying to get a 10s lag as the addon is checking every instance in the game. 4. Bug: When you get the last item a boss can drop for the instance and refresh the individual instance, the name stays there with an empty space underneath it instead of disappearing completely. 5. This one is more of a suggestion, rather than a request, but it would be nice to be able to filter out the instances by expansion. If you choose to implement any of these things, that would be awesome. Thanks a lot for making this addon in the first place! 1. Good idea, I'll see what I can do. 4. Thank you for reporting this, will try to fix that. And again, don't be afraid to suggest anything. Thank you for the warm words. i think he means when all transmogs for that instance is collected. great addon btw, all i was missing from mogit/wardrobe addons.